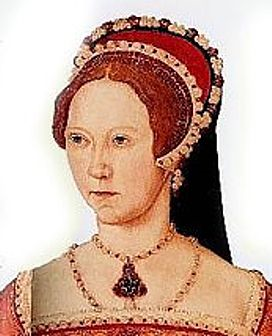 During the bloody reign of the staunch catholic Queen, Mary I, two ordinary men from East Anglia were put to death for their defence of Protestantism. 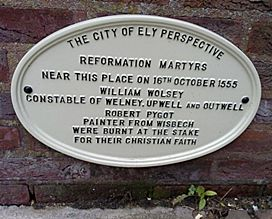 William Wolsey and Robert Pygot were among nearly 300 people burnt at the stake for heresy during Mary’s five years on the throne. These two humble martyrs, William Wolsey and Robert Pygot, were among the many protestant victims in Queen Mary I’s reign. She succeeded her protestant half-brother – the boy king, Edward VI in 1553. The Church of England had been rapidly reformed along more protestant lines during Edward’s short reign. These included the abolition of clerical celibacy and the Mass, and the imposition of compulsory services in English. Mary had always rejected England’s break with Rome and her immediate aim was to re-establish Catholicism in England – a goal to which she was totally committed. She wasted little time. Her first Parliament abolished Edward’s protestant legislation just months after she came to the throne. Roman Catholic doctrine was restored and the crime of death for heresy against the Vatican was re-instated. 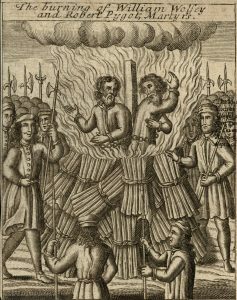 Under Mary, England was thrown into a phase of severe religious persecution and hundreds of martyrs were put to death by the barbaric method of being burned alive. The people of East Anglia, and especially the Fens, were prominent in the events surrounding the Reformation and the Catholic Revival. Among them were the two Ely Martyrs, Wolsey and Pygot. William Wolsey, a Constable at Upwell, near Wisbech, objected to the Catholic doctrine of transubstantiation – that the bread and wine on the altar literally became the body and blood of Jesus Christ after the priest had spoken the words of consecration. He had obtained a smuggled New Testament in English and, after reading it for himself, had become convinced that the Roman doctrine was erroneous. He was deprived of his office when one of the Justices noticed that, although Wolsey was a regular worshipper at the parish church, he used to absent himself from the Mass. Still refusing to attend, he was summoned early in 1555 to appear before the Ely Assizes, the city’s principal law court, and was confined to prison. The following Easter week, Wolsey was brought before several senior clergy, including Dr John Fuller, Chancellor to the Bishop of Ely, to explain his position. He was told that as a layman he should “meddle no further with the Scriptures”. But Wolsey remained unmoved, and Fuller lent him a book by the Bishop of Lincoln, Thomas Watson, in the hope that he would be persuaded to recant his objection to the Mass. Remaining in jail, Wolsey took the book, read it in detail and marked his disagreements against the text. When Fuller returned, Wolsey declared: “Sir, I like the book no otherwise that I thought before I should find it.” The Chancellor took it back and returned home. Before Wolsey was due to appear in court, this time before the Wisbech Assizes, Fuller visited him telling him that he “much troubled his conscience.” He told him if he were to “rule his tongue” and attend church, he would see that he was let off. But Wolsey turned down his offer, still maintaining that he must be “witness to the truth”. The next time he appeared in court, the judge sent him to Wisbech Castle, at that time a notorious Tudor prison. Meanwhile, a local painter and builder, Robert Pygot, was also summoned to appear at court for failing to attend Church. Pygot met the same fate as Wolsey and before long the two men were transferred to Ely jail where they remained until their death. On 9th October 1555, Wolsey and Pygot were brought before a Commission which included John Fuller and the Dean of Norwich, John Christopherson, who tried them both for heresy. By now, Fuller had already dismissed Wolsey as “an obstinate fellow” but he believed that Pygot could be persuaded to recant. So Christopherson called for a pen and paper and Pygot was asked to sign a document saying he believed the catholic doctrine of transubstantiation. He refused, and the two men were sentenced to death. While awaiting his fate, Wolsey suffered severe toothache and feared he might die before his execution. But within a week a young priest was summoned to preach the execution sermon. The two martyrs were led to the Cathedral Green and chained to the stake. An official carried a huge sheet containing copies of the banned English New Testament which were also to be burnt. Wolsey called on God to forgive his enemies and the two men grabbed a book each and in defiance began reciting Psalm 106 as the flames began to leap around them. And so these humble, but courageous martyrs gave up their lives for their faith on 16th October 1555 – the same day that Bishops Hugh Latimer and Nicholas Ridley were martyred at Oxford for their part as two early evangelicals who led the English Reformation.